You might find yourself humming Paul Simon’s “Under African Skies” after seeing these stunning images! 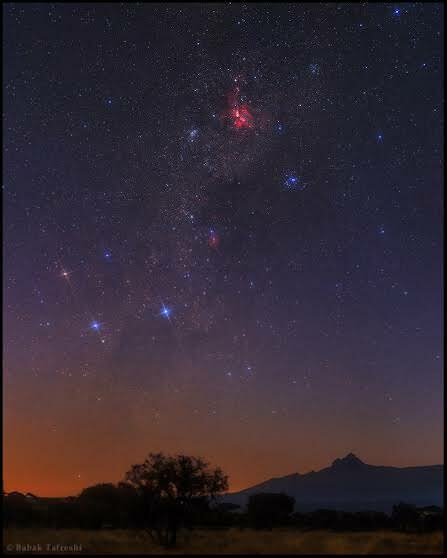 The World At Night photographer Babak Tafreshi has just returned from a trip to Kenya and has amassed a gorgeous collection of astrophotography showing Mt. Kilimanjaro by night (and some in the day, as well). Below you can see a panoramic view of Kilimanjaro in the moonlight, flanked by giraffes (can you spot the zebra, too?) and starry skies. Giraffes and acacia trees against the spectacular moonlit backdrop of Mount Kilimanjaro, as seen from Amboseli National Park, Kenya. The head of a zebra is also visible on the left. The main peak of Kilimanjaro is Kibo that reaches 5,895 m (19,341 ft). The smaller peak is Mawenzi at 5,149 m (16,893 ft) and meaning the moon in Swahili. Credit and copyright: Babak A. Tafreshi. See more great images from Babak’s trip at the Dream Views website here. A new image captures the stunning view of the night sky over ESO’s Paranal Observatory, with a treasury of deep-sky objects. The image was taken by Babak Tafreshi, an astronomer, journalist and director of The World at Night (TWAN). It shows the Carina Nebula, glowing intensely red in the middle of the image. Below Carina is the the Wishing Well Cluster (NGC 3532); then to the right is the Lambda Centauri Nebula (IC 2944) – which is also called the Running Chicken Nebula. Above this nebula and slightly to the left is the Southern Pleiades (IC 2632), an open cluster of stars that is similar to its more familiar northern namesake. In the foreground, is three of the four Auxiliary Telescopes (ATs) of the Very Large Telescope Interferometer (VLTI). See more information about this image from ESO.